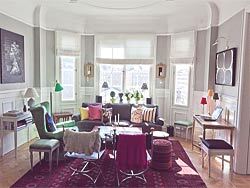 To make a booking, check availability or have more information, contact us on e-mail info@costockholm.com. We will reply asap with a suggestion to suit your plans. 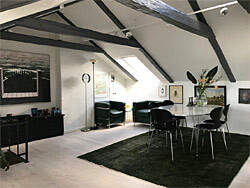 Marvellous, unique 3 room attic accommodation in the affluent Östermalm area for 1-4 Stockholm visitors - everything within walking distance. Newly built, unique contemporary design 2 room apartment with balcony for 1-2 persons. 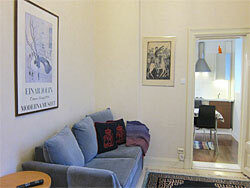 Grand, beautiful 2,5 room apartment for 1-3 persons in Stockholms most prominent area. Perfect for the corporate traveller. Homey and spacious 2 room apartment with a premium city location, everything nearby. Ideal for a couple, maybe with a child. 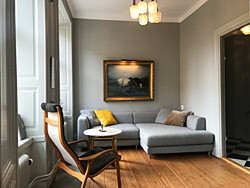 Beautiful, high standard 4 room apartment for 1-4 persons in a charming, historical neighborhood in central Stockholm near everything. proudly welcomes up to 4 adults. 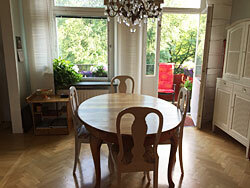 In one of Stockholm's hottest areas, this spacious 2,5 room apartment perfectly accommodates 1-5 persons. 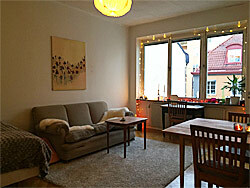 Roomy 2 room apartment with a peaceful park location in trendy Western Södermalm. 1-3 persons..
Amazing 3 room apartment for 1-5 persons with a unique city location in a beautiful building from 1902. 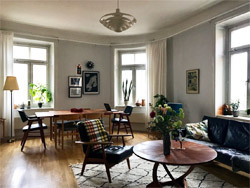 Large 2 room apartment with a unique city location in a beautiful building from 1902. 1-3 persons. 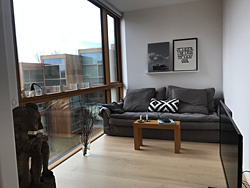 Cool city life and scenic waterfront walks combined in this studio for 1-2 persons. Fantastic 5 room penthouse apartment of two floors in the heart of Old Town. 1-5 persons. 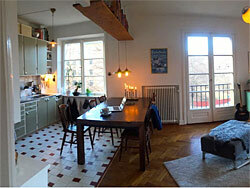 Feel the wings of history in this lovely 2 room apartment. Ideal for 1-2, possible for 3 persons. 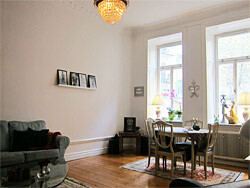 Homely two room apartment for 1-4 persons with a perfect location by Mariatorget square. Cozy 2,5 room apartment with a personal touch, welcomes up to 4 people. As central as you can be. 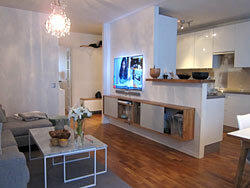 Beautiful newly renovated 2,5 room apartment in one of the trendiest areas in Stockholm. 1-3 persons. Modern, perfect family apartment with 5 rooms and never-ending views. Very quiet, no transparency, up to 7 persons. 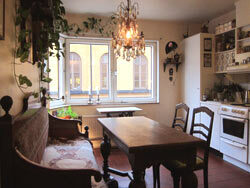 Large, romantic-bohemian 2 room apartment for 1-2 persons, with a prime position in Södermalm. 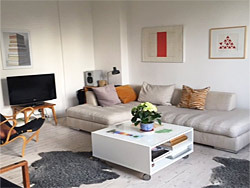 Fresh, modern-style studio apartment on wonderful Mariaberget hill with walking distance to Old Town and the best of Södermalm. 1-2 persons. 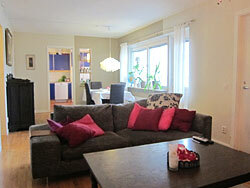 Classy and spacious 2 room apartment for 1-4 persons in homey, residential Vasastan. 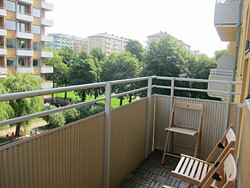 Light, central and newly renovated studio apartment for up to 1-3 persons by beautiful Tessinparken. 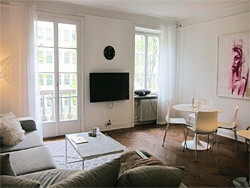 Stylish, absolutely central 2 room apartment for 1-2 persons, walking distance to everywhere. 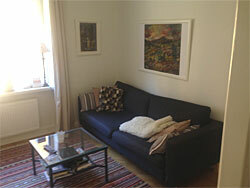 Homey 3 room apartment in the centre of Södermalm offered for 1-4 persons. 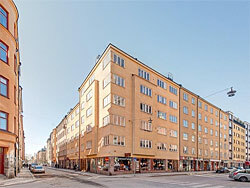 Grand 5 room apartment overlooking Medborgarplatsen square and Björns Trädgård park. For 1-6 persons. 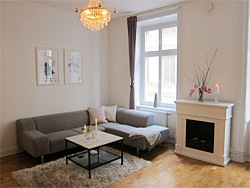 Peaceful 2 room apartment for 1-4 persons in one of Stockholm’s best city positions. 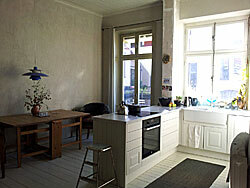 Homely, social 2 room apartment in an authentic city area. 1-3 persons. 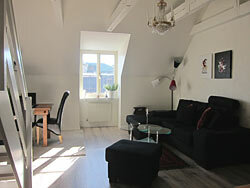 Cozy 2 room apartment for 1-2 persons located in trendy Hornstull by the boardwalk with canal views. 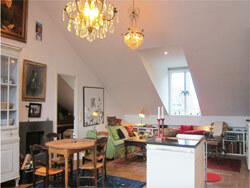 Wonderful 3 room attic apartment with terrace, nicely located at the border of Östermalm and Vasastan. 1-5 persons. Bright and beautiful 3 room apartment with a wonderful central location, walking distance to most places. 1-4 persons. Looking to stay central? This cozy studio apartment wins first prize. 1-3 persons. 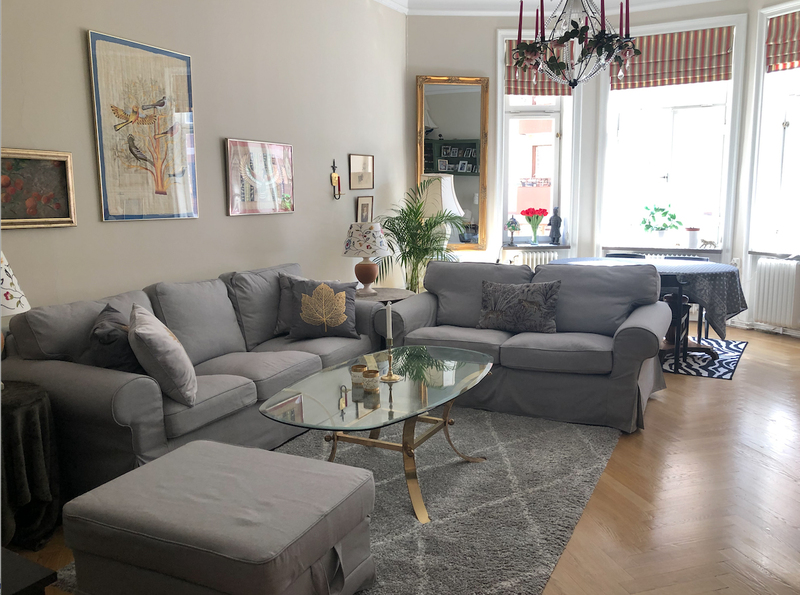 Beautiful, spacious 2 room apartment in a pleasant part of affluent Östermalm, peaceful, also near nice restaurants and parks. 1-2 persons. city position near the Humlegården park. 1-4 persons. 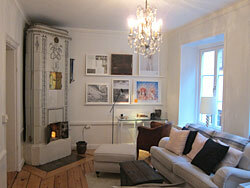 In the heart of central Stockholm this beautiful 1,5 room apartment welcomes 1-3 persons. 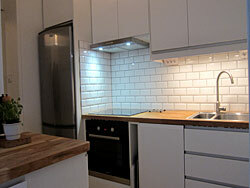 Social, spacious 3 room apartment welcoming 1-4 persons, located in one of Stockholms most booming neighbourhoods. 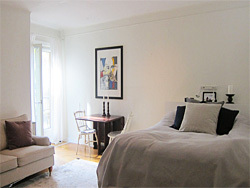 Picturesque sea-view studio apartment on wonderful Mariaberget hill with walking distance to Old Town and the best of Södermalm. 1-3 persons. 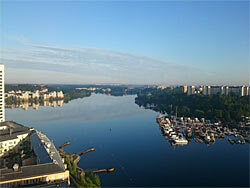 This 3 room / 2 floor attic apartment proudly presents Stockholm city at a high level. For 1-4 persons. Beautiful 3 room apartment with a perfect combination of trendy city life and scenic waterfront promenades. For 1-4 persons. 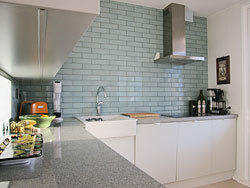 Convenient, roomy and family-friendly 4 room apartment with a superb position near all amenities. 1-6 persons. Perfect 4 room apartment with a wonderful central location, walking distance to most places. 1-6 persons. 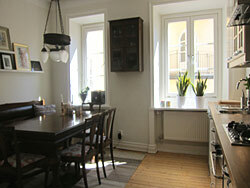 Two room apartment with a charming cultural location centrally on Södermalm, available for up to 4-5 people. 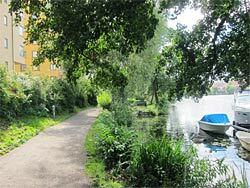 Combine city life with water and nature, all within walking distance? 1-4 persons. 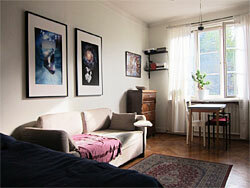 Tasteful 3 room apartment in a functionalist style building by famous Swedish architect Sture Frölén. 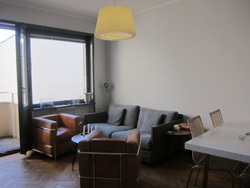 Cozy two room apartment in the trendy SOFO area. 2 bedrooms, 1-6 persons. Absolutely central turn of the century 3 room apartment, walking distance to everywhere. 1-5 persons. 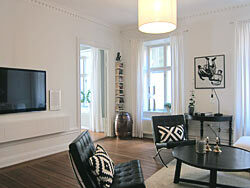 Stylish, well-planned two room apartment harmoniously situated in the area of Gärdet. Up to 3 persons. 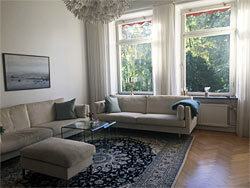 Family oriented, modern 3 room apartment on pretty Lilla Essingen island, well connected to Stockholm inner city. send us an e-mail anyway. We might have new objects not yet posted on the website.